Leading Exporter of hospital garment from Kolkata. Our organization is highly appreciated by the clients for offering a wide range of Hospital Garment. 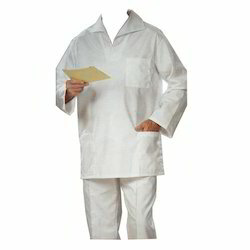 These Hospital Garments are designed using superior quality fabric as per the set medical standards and norms. Moreover, we offer these garments in different sizes and patterns to meet the diverse requirements of our clients. These garments can also be customized as per the requirements of our clients. Looking for Doctor Aprons ?